Free download of webcam software for broadcasting, recording, streaming and viewing web cams. Do more with your windows computer and camera: install this webcam program for Windows in no time. The websites creator or author is Seiz System Engineering. Copyright (c) 2011 by Seiz System Engineering is the owner of the copyright for this website. three profiles were found for Ablecam.net in social networks. Among other social networks the website is represented in Facebook, Twitter and GooglePlus. 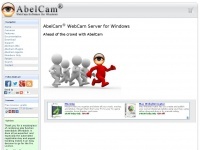 The web server used by Ablecam.net is run by Nine Internet Solutions AG and located in Switzerland. This web server runs 3 other websites, their language is mostly english. The webpages of Ablecam.net were developed using the programming language Python. HTML 4.01 Strict is used as markup language on the webpages. Among others Google Analytics and Piwik are used to analyze the visitors on the website. Indexing the data of the website and following hyperlinks on it is explicitly allowed by robot information. The website contains advertising by Google Adsense. Visitor Tracking/analysis: The website uses Google Analytics and Piwik to analyze the visitors.